When I was diagnosed with ist after my second failed ablation, my cardiologist explained to me that nobody knows what exactly causes ist, and the main question always seems to be whether ist represents a primary disorder of the sinus node, or whether instead it represents a more general problem of the autonomic nervous system the condition dysautonomia, doctors all have different views on ist some still even believe the condition is related to anxiety, but as my cardiologist explained to me it was something that needed more research done to figure out the actual cause and since there's very little known about it there's no cure at the moment and its all trial and error on managing symptoms with medication, ablation of the sinus node itself can fix ist but its a temperately fix and the heart heals itself and the symptoms will return, or for some like myself end up needing pacemakers. Suffers with inappropriate sinus tachycardia suffer from a range of symptoms such as breathlessness, fatigue, syncope, pre syncope, dizziness, blurred vision, sweating and blood pressure problems. Ist seems to effect healthy young females more than men. Getting diagnosed with ist is quite difficult and for me took over a year and endless tests such as ecg's, 24 hour tapes tilt table tests, scans, x-rays, checking my adrenaline levels by peeing in a large bottle for a whole day which was not fun and also an electrophysiology study (ep study) were all that was found was how my heart was fast constantly without a reason for it to be. Everyone with ist is effected differently some people have very little symptoms were as others are so severely effected they have to give up work etc, I am lucky for the reason that even though ist does effect my life a lot I am blessed to have a good cardiologist who has always helped me mange my symptoms and after 3 failed ablations has put me on the list for a pacemaker which won't cure it but will help manage the symptoms and I know throughout the ist community most people aren't as lucky as me and most are just told to get on with it. You wake up around 7ish; you never feel refreshed in the mornings no matter how much sleep you get. It feels like you have been out drinking and partying all night as your head is absolutely pounding. You have only slept for about five hours as you have insomnia, and you wake up on many occasions with your heart pounding in your chest and the chest pain you actually could swear your dying. It takes you ages to find the will to get up, over an hour in fact. When you sit up, that's when your head really starts to pound and the room spins. You open the curtains, the light feels so bright it's painful and you experience the bright flashes because you have terrible light sensitivity and the awful side effects from ivbradine make your eyes hurt more. You stand up to go to the toilet and your heart immediately starts pounding. By the time you have got to the toilet you are really out of breath, exhausted and weak; you need to sit down before you do anything else. Making breakfast is pretty exhausting. Your heart just gets faster so fast in your chest. It's probably beating about 150bpm and eating it, well that just makes your heart beat even faster You can try and read or watch tv but you can only manage this for a very short period due to brain fog. Coffee is out the window as that will just increase your heart even more so you either drink water or green tea and swallow your medication. You dread showers as they make you feel absolutely awful, The shower is cold as heat makes your heart rate increase further which is definitely not what you want and standing in the shower is a task when you feel dizzy. You sigh with relief when the shower is over. They say having Ist is like running a marathon all day every day. But showers feel like you have added an additional marathon on top of the one you were already running. You now have to rest flat out on the sofa to ease the symptoms from the shower. Drying your hair, well the heat just makes you feel even worse and all the effort of brushing your wet tangled hair, leaves you even more exhausted you could lie down again, getting dressed well that just uses up some more of the little energy you do have left and bending down to put your socks on your freezing cold feet makes you feel faint. Lunchtime feels much the same as breakfast. But except You are even more tired and weak it feels like your forcing yourself to make a sandwich.. You wish you could call your friends, but you are too tired and it would probably cause you to feel worse due to over-exertion. 4.30pm Your husband gets home from work. It's so nice to talk to someone and in my situation help me with Kian feeding him and bathing him. By 7:30pm your too tired to do anything. You want to go to bed there and then but it's too early and you wouldn't sleep. So you curl up on the sofa and try and watch some telly for me its catching up on hollyoaks or pretty little liars. Bedtime involves falling into bed exhausted, weak and frustrated feeling like you have achieved very little. Can you imagine living like this everyday? It's probably hard to imagine if your so well. But for people with ist almost everyday is living like your running a marathon, and for me that is how my life has been. You have good days and bad days, bad days when you faint and you can barely get out of bed and good days even though your heart still races you do have energy to do things but its still difficult and I like to tell people I can and I will but it may just take me a little longer. 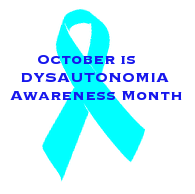 I really hope this provides a better understanding of dysautomania and ist and you can help me spread awareness by sharing and as I have said before hopefully one day more research will be done on ist.